Growing up I was a huge No Doubt fan. I even saw them in concert right after the Rock Steady album was released. Oh man, did I love Gwen Stefani. So when I heard about the Urban Decay collaboration, I was super excited. My favourite shadows with my preteen style icon. This palette definitely fits Gwen's pin-up inspired vibe. Lots of light neutrals to pair with winged liner and red lips. There are a couple of brights thrown in and some smokey shades, perfect for deepening that outer-v. My favourite combos so far are Steady & Punk and Baby & Serious. Skimp or Blonde for the inner corner, and the many matte shade options, loving Anaheim, for a transitional/blending out shade. 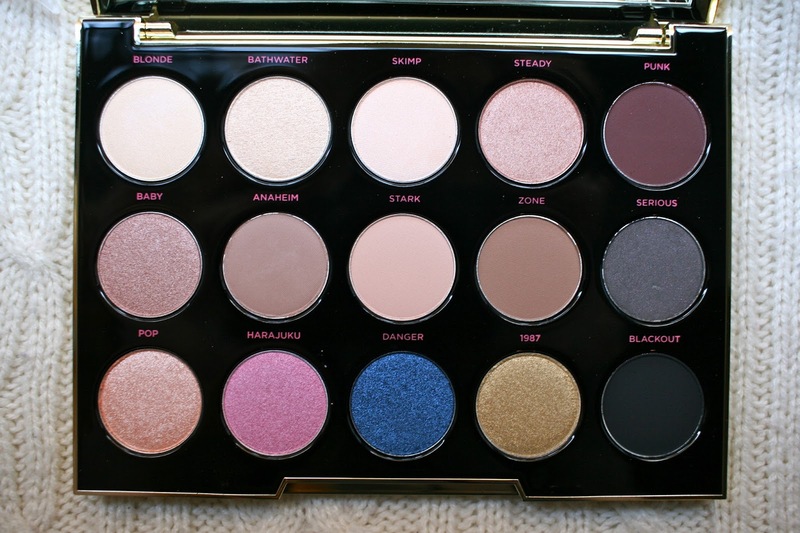 Though lately, I've been into more middle-toned shades which this palette really doesn't have any options. It's either light or dark, but it's been fun to go back to that look. If you are a fan of champagne shades, this is definitely the palette for you. You have all different variations of champagne-copper (Pop), taupe (Baby), golden (Bathwater), rose (Steady). But again, they are all light champagnes. I have been using this palette all week and haven't needed any other shadows. It's all here. Though, I know I will end up missing my mid-toned taupes. For that, I am adding UD Naked Smoky to the Christmas wish list. What are your thoughts on the UDxGwen collab?